Yellow Winter Jasmine (Jasminum nudiflorum): growing, planting, caring. A popular climber with a winter blooming. 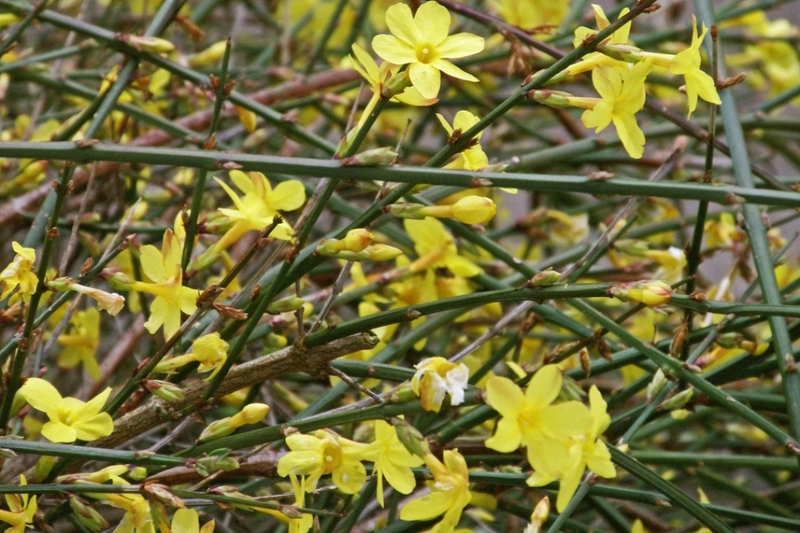 Jasminum nudiflorum - the winter jasmine - is a deciduous shrub native to China and widely cultivated as an ornamental plant. It grows up to 3 m (10 ft) tall with arching green shoots, opposite, pinnate, dark green leaves and bright yellow or white flowers appearing on the bare stems - hence the Latin nudiflorum - from November to March. It can be trained against a wall to provide extra warmth and shelter, requires pruning in spring after flowering and likes full sun or partial shade. It is at first to the smell of its flowers that one recognizes the jasmine, but not the jasmine of winter! It is recognizable by his arched stems, and its endless yellow flowering. It bears flowers in tube, which open in tray, formed of six petals. These appear before the leaves that are trifoliate, with oval, simple leaflets. Plant in spring or fall, in a well-sheltered spot in the sun or partial shade, knowing that the exposure determines flowering, in ordinary soil or rich soil, properly drained. Provide a support on which the plant will be able to climb, along a wall or on an arbor for example. If your soil is sandy, add compost to the planting hole, and in very heavy soil, amend with sand and compost: jasmine does not like stagnant water, do not make a bowl on its foot! In early summer, cover the foot with a light mulch to keep the soil cool - conversely in the fall, a thick mulch will eventually protect your jasmine from the cold bites! Water generously and not too often in spring and in summer for the first year, a little less the second, and then mostly during high heat periods and that is all: outside of particular conditions, your plant will manage very well on its own (rainwater is gentle which is perfect!) If it is potted, you must think about it from time to time and water when the soil is fairly dry. Do not prune the first years, this plant takes its time to settle. Let it grow at its own pace, you will be amazed at its vigor afterwards. Shorten the twigs every year, after flowering, if you want to keep it compact. Also remove some of the old twigs that are gradually covered by younger ones. If you have chosen a frost-sensitive variety, and you grow your jasmine in a pot, bring it inside for the winter, in a bright room, but not too hot. Take out your jasmine in pot, when the last cool nights are over. Find a sunny location, sheltered from the wind. Multiply your jasmine by taking cuttings or by layering! Layering works like this — at the very beginning of spring, pick a nice, long, and healthy branch growing from the base of the plant. Approximately every 20 cm, strip the leaves from the stem in five cm sections, then make a shallow cut in each bare patch with the help of a grafting tool or a sharp, disinfected knife. Bend the branch gently down to the level of the ground, hold it there, and dig 15 cm circular holes corresponding with the stripped sections. Fill the holes 3/4 up with potting soil and sand, mixed together. For each section of cut branch, fasten it to the ground with u-clips or garden pegs. Each section must be located over it's corresponding hole. Refill the holes and gently pack the mixture down. Finally, straighten the end of the branch, staking it into the ground at the end if necessary. Water copiously! The following autumn, check for the presence of roots. If everyone goes well, use your pruners to cut the new plants from the mother's root, then keep them sheltered until the following spring! To grow from a cutting, operate after flowering. Take a 15 cm long cutting and remove the lower leaves, keeping the ones closer to the top. In a pot, arrange a base of gravel for drainage, then add a mixture of sand and peat moss. Press down with your fingers. Dig a 10 cm whole to place the cutting in. Water with a fine mist. Place the pot in a dark location, inside, and keep it moist. You can plant it the following spring.